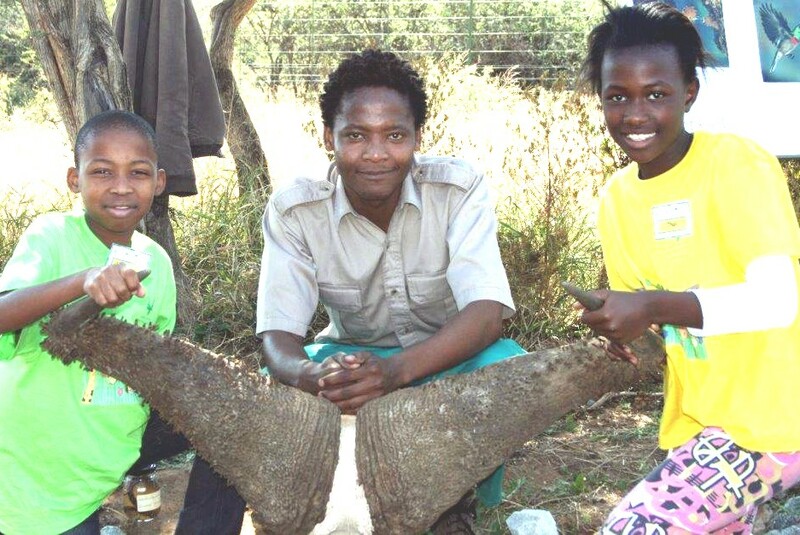 From Left – Boitshepo Makgaka (12), Mr Adam Manyane and Thuli Mongatane (12) admire a Buffalo scull during the Environmental Education camp that was recently held at Marakele. South African National Parks (SANParks) recently hosted its Environmental Education weekend for the youth at Marakele National Park. The weekend camp was attended by a total of 60 learners from Gauteng and is part of SANParks’ Kudu green school initiative (KGSI), an environmental programme which started in 2010 that is targeted at the urban school going children. This initiative strives to enable learners of all ages to gain an understanding of climate’s influence on society as well as appreciation of the environment they are living in and it targets learners from urban areas, said Ms Maria Moate, Chairperson of the Gauteng Environmental Alliance and Head of Environmental Education at SANParks. She said the reasons behind the selection of the schools in urban areas was that urban based schools, especially those in previously disadvantaged communities, have had minimum or no exposure to national parks, awareness of conservation issues and opportunities in the environmental field. Moreover, the weekend camp got the learners to discuss and come up with environmental solutions towards sustainable living, assisted leaners to be able to solve environmental problems that they have at their schools and also gave them exposure to the wilderness. According to Ms Moate the KGSI started with only 7 schools but “at the moment we have 20 schools from different districts in Gauteng that are registered under the Programme. This initiative enables learners and educators involved to gain an understanding of climate impact on humanity”.